Figure 1. This 1.18 ct Fancy Intense blue diamond was recently seen in the New York lab. Photo by Jian Xin (Jae) Liao. Natural blue diamonds are extremely rare in nature and highly desired within the gem industry. One of the world’s most famous gemstones, the Hope diamond, is classified as a natural type IIb blue diamond. It contains the impurity boron within the diamond carbon lattice. The presence of boron as an impurity in natural diamond is rare, as the amount of uncompensated boron found is typically less than 0.5 ppm. 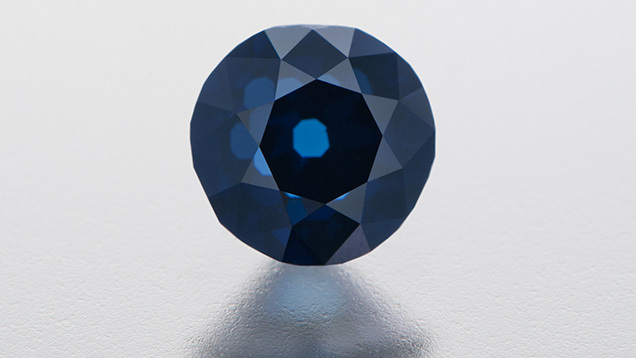 Housed in the Smithsonian Institute in Washington, DC, the Hope is part of a collection incorporating many boron-containing natural type IIb diamonds, and has been part of a study relating boron concentrations and the intensity of blue coloration in natural and synthetic diamond (E. Gaillou et al., “Boron in natural type IIb blue diamonds: Chemical and spectroscopic measurements,” American Mineralogist, Vol. 97, 2012, pp. 1–18). The East Coast laboratory recently received a 1.18 ct Fancy Intense blue diamond (figure 1) for a colored diamond grading report. The diamond’s old European-style cut indicated that this was not a recently faceted gemstone. The clarity was very high, adding to the rarity of this blue diamond. When exposed to short-wave UV fluorescence (about 230 nm), the diamond displayed blue phosphorescence (figure 2). Phosphorescence is a diagnostic feature of natural type IIb diamonds; red phosphorescence is also frequently observed, the most notable example being the Hope diamond. Figure 2. Blue phosphorescence was observed in the DiamondView after the stone’s exposure to strong short-wave UV radiation. DiamondView image by Paul Johnson. Infrared absorption spectroscopy identified the diamond as type IIb, with a very high concentration of uncompensated boron for a natural diamond, even for a stone with synthetic boron doping (figure 3). Further analysis, including photoluminescence spectroscopy, proved it to be a natural diamond. From the mid-infrared absorption spectrum, we determined a boron concentration of 5.84 ppm atomic. By normalizing the mid-IR spectrum, we obtained the integrated intensity of an absorption peak centered at 1290 cm–1 (A.T. Collins, “Determination of the boron concen­tration in diamond using optical spectroscopy,” Proceedings of the 61st Diamond Conference, 2010, Warwick, UK). Most documented type IIb diamonds in this color range only have recorded uncompensated boron concentrations between approximately 0.24 and 0.36 ppm (E. Gaillou et al., “Study of the Blue Moon diamond,” Winter 2014 G&G, pp. 280–286). Figure 3. 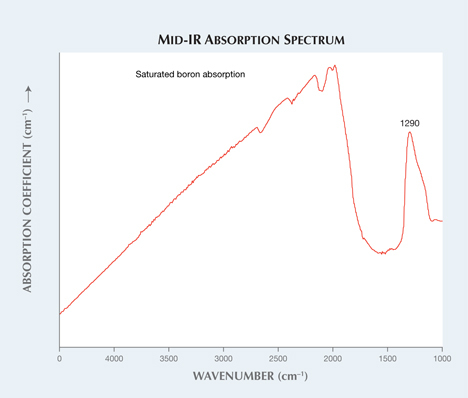 Normalized mid-IR absorption spectrum of the 1.18 ct Fancy Intense blue type IIb diamond, with saturated boron–related absorption and a 1290 cm–1 peak. This is the highest boron concentration ever reported in a natural diamond. Compared to other documented type IIb diamonds, the concentration is staggeringly high. This diamond’s intense blue color rivals that of the Hope, leading one to believe that boron contributes strongly to the color of natural blue type IIb diamonds. This has never been proven, however, and there is not a well-defined relationship between blue color and uncompensated boron concentration in diamond (Gaillou et al., 2012). 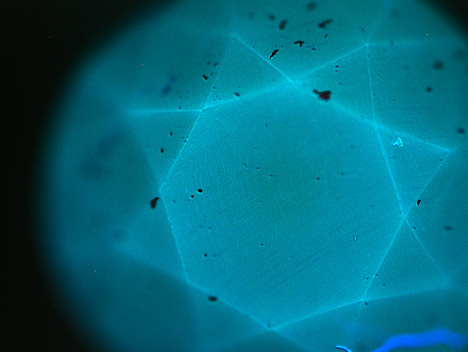 Further observation and analytical study may prove a correlation between optically active boron and the intensity of blue color in natural diamonds. Paul Johnson is a researcher, and Wuyi Wang is director of research and development, at GIA’s New York laboratory. Two historic blue diamonds, the Hope and the Wittelsbach-Graff, appeared together for the first time at the Smithsonian Institution in 2010. One of the most popular exhibits at the Smithsonian Institution, the stunning “fancy dark grayish blue” Hope diamond was formally graded by GIA’s gem laboratory.